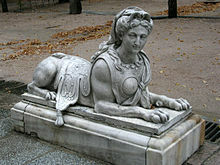 Magna Sphinx Gizensis pro Magna pyramide Gizensi iacet. Statua cuiusdam sphingis Segoviae in Hispania sita. Sphinx (Graece Σφίγξ, Boeotice Φίξ) est monstrum mythicum cui est caput hominis et corpus leonis. In mythologia Graeca, sphingi sunt caput hominis, coxae clunesque leonis, atque aliquando alae avis. Perfida et immisericors habetur. Qui recte eius aenigma non respondeant fatum patiuntur ut in talibus fabulis usitatum est, quia monstrum eos necat et comedit. Quod sphingis exemplum in mytho et dramate de Oedipode legitur. Sphinx autem Aegyptius, sphingi Graeco dissimilis (qui est mulier), usitate homo monstratur, androsphinx (Graece Ανδρόσφιγξ) appellatus. Praeterea, sphinx Aegyptius benevolus habetur, quamquam saevis viribus praeditus, exemplo Graeco similis, et ambo custodes memorantur qui aditus templorum saepe tegunt. Sphingis parentes sunt Echidna et Orthos vel Typhon. Quae post mortem Laii, Creonte regente, in Monte Phicio prope Thebas sedet, ubi aenigma viatoribus proponit: quid animal mane quattuor pedibus, meridie duobus, vesperi tribus ambulat? Oedipus recte aenigma explicat: tale animal est homo. Clay, Jenny Strauss. 2003. Hesiod's Cosmos. Cantabrigiae: Cambridge University Press. ISBN 9780521823920. Dessenne, André. 1957. Le Sphinx: Étude iconographique. De Boccard. Edmunds, Lowell. 1981. The Sphinx in the Oedipus Legend. Königstein im Taunus: Hain. ISBN 3-445-02184-8. Kallich, Martin. 1968. Oepidus and the Sphinx. In Oepidus: Myth and Drama. Regier, Willis Goth. 2004. Book of the Sphinx. Lincolniae Nebrascae: University of Nebraska Press. Stewart, Desmond. 1979. The Pyramids and Sphinx. Newsweek. ISBN 0882252712, ISBN 978-0882252711. Vicimedia Communia plura habent quae ad sphinges spectant. Siegel, Janice. 2001. The Sphinx and Oedipus Rex. Situs people.hsc.edu. Novissima mutatio die 6 Aprilis 2019 hora 12:47 facta.